Every year around this time, my friend and fellow blogger Alison mentions that she is taking part in a yearly reading challenge (this year, it has been termed an event) called R.I.P. This delightfully spooky happening, hosted by Carl of Stainless Steel Droppings, asks readers and bloggers to commit to “imbibing all things ghastly and ghostly” during the months of September and October and then to share what they’ve read with others. Seeing as I have a taste for these types of entertainment all year round and I always read/watch more creepiness in October than any other month, I figured this had to be the year that I stop just watching from the sidelines and actually participate. There are a number of “perils” that readers can sign up for, and though it seems ambitious, I’m going to shoot for three: Peril the First (4 books that fit the R.I.P. 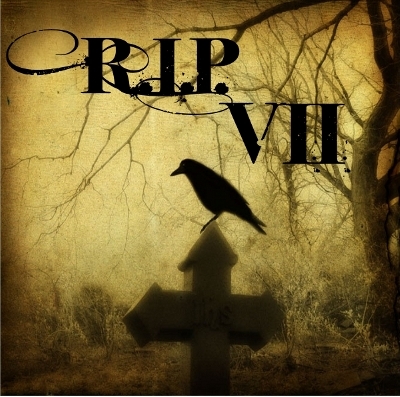 criteria: “mystery, suspense, thriller, dark fantasy, gothic, horror, supernatural, or anything sufficiently moody that shares a kinship with the above”), Peril of the Short Story (short stories that also fit the R.I.P. criteria, as many as you choose) and Peril on the Screen (films and television shows that, of course, fit the R.I.P. criteria; again, as many as you choose). Woo! Always happy to sucker someone into reading all the books. You should recommend some good movies for me! Ask and ye shall receive: My very favorite horror film is Rosemary’s Baby, but I also love Don’t Look Now, Wait Until Dark, Hitchcock’s Rebecca (watch this if you won’t ever read the book! ), Psycho, Rear Window, Session 9 and Perfect Blue. That’s a nice sampler of creepy flicks, I think! ohhh the Thirteenth Tale is a fabulous read!! I can’t wait to read your review of it. Hooray for getting off the sidelines and joining in! Great to have you with us, especially since you obviously share a kindred love of this kind of ghastly goodness. Thanks so much for joining in!!! Like Pat I’ll bang the drum for The Thirteenth Tale. It is a favorite. We do a bunch of appropriate film watching during the later part of Sept. and all through October every year as well. Just like with the reading I never get enough time to watch all that I would like to watch. Still, its fun to work in as much as one can.